Last year some big names were revealed on the allegations of sexual misconduct and then they had to resigned or were fired from their prestigious positions. #MeToo movement in India and abroad has completely chanced the society and also the workplace. Since #MeToo movement has appeared in the headlines, the way sexual misconduct is handled has completely changed. #MeToo has opened a completely ignored issue which is now being discussed openly. The wave of me too in the workplace is having a ripple effect across all the countries and therefor, hiring managers need to do some serious thinking. Me too movement business response has become significantly important. HR managers must always be open to listen carefully what accusers have to say. Ignoring them or not taking them seriously can be a big mistake. Therefore, HR managers must understand that all everyone should be given a fair chance to keep things sorted and right. Since the times social media platforms have become an easy and popular place to express, taking sexual misconduct easy is making a big mistake. If there are cases of sexual harassment at your workplace and you have failed to address them then they can definitely surface as #MeToo movement damaging the reputation of the organization. Therefore, giving more time into hiring employees that are good in conduct is the need of the hour. An effective solution of a problem is possible if you understand the reasons behind it. HR managers must find out the reasons which cause sexual harassment or have led to me too in the workplace. This would require to know what a male and a female employee undergoes. This is an extremely sensitive subject and requires managers to constantly keep understanding and evolving with times to know the behaviours and have policies to correct them. HR Managers must work out to create a wholesome sexual harassment policy which is very clear and complete. This policy has to be fair and applicable to all the employees. This policy must contain the steps to be followed in case of sexual harassment at work. Not only that, the policy should also highlight the consequences an employee will face if charges of sexual harassment are proved. It is very important to keep the track record of employees. Recording smallest of the behavior that is not correct can be very beneficial in controlling problems like sexual harassment. It simply shows how vigilant is a company about anything wrong that happens. It is not enough to have sexual harassment policy because organizations have to take strong actions against those who are found guilty of it. If the organization takes strict actions against the culprits then they not only show their support to the ones who have undergone the torture but also put an end to many such episodes which could have otherwise happened. One right act sets many things correct for the future. 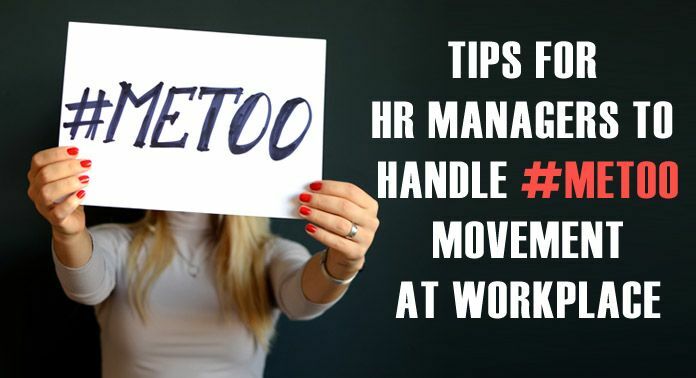 It is very important for employees to know what actions are considered sexual harassment and for that many organizations have started to conduct me too movement training. If employees are aware of the right and wrong conduct and they know whom to report then they will be able to report such incidents better and there will be a strong check on those who are involved in this kind of misconduct. By training employees on sexual harassment, they can be better clarity on what actions they can take. By following these tips, you can save me too in the workplace by proactively solving the issues of sexual harassment.